It’s 6am and I can’t get back to sleep. At least my roommate, a nice young man from France here to get boxing lessons (??) was quiet. I finally decide to wash my clothes, which in hindsight I should have done last night with all the others. Of course, damp clothes are in the dryer, and a load of bedding is in the washer. 😒 I restart the dryer and search for tea. Success! In a cabinet labeled “Free food for Guests”. So I sit and watch the morning out the window. It hasn’t rained. After a bit I can start my clothes, I make a second cut of tea and I realize I’m hungry. Now, I’m wearing my bathing suit, short sleeve t-shirt, flip flops and down jacket. Pretty much “the crazy old man at the bus station” outfit. It’s chilly outside and I can’t walk to a restaurant. I go back and search the “Free Food” cabinet. Oooo, microwave popcorn! Success! So I’m sitting here in my bathing suit, eating popcorn at 7:30 in the morning and thinking: This is my life now. And, I’m OK with that. I’m going to be in Big Bear at least most of today. Other than purchasing another 5 days of food for the next leg of my trip, I need shoes. Badly. They are worn out on TOP with two gaping holes per shoe. I’m not pleased. After only 266 miles I’m replacing $140 shoes with lots of tread on the bottom. Not sure I can afford to keep using my Cascadias. 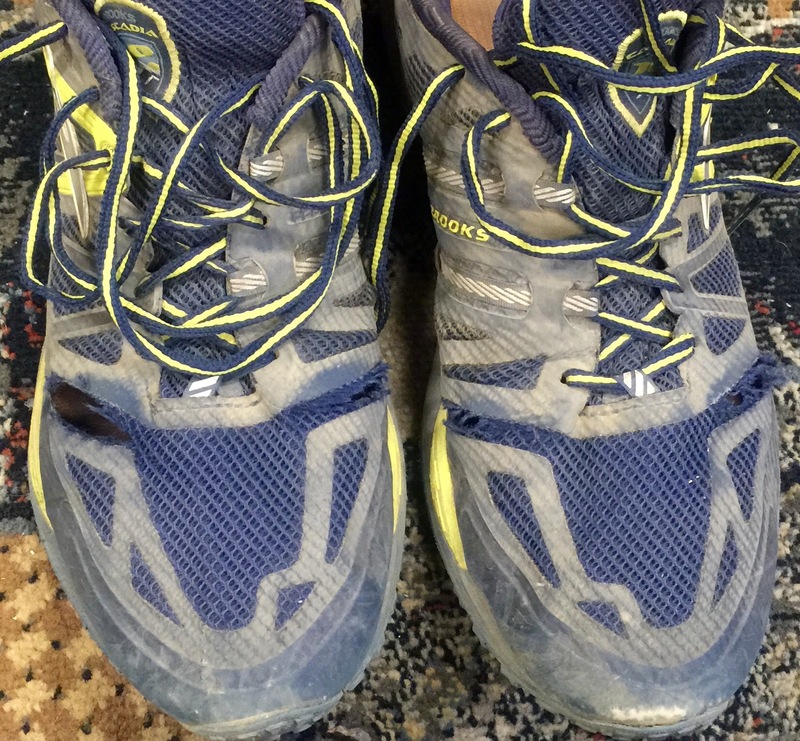 My 24 miles yesterday was made harder because I had to dump out the sand in my shoes every 2-4 miles. Very annoying. Apparently this is a defect with all Cascadias. I met a mother/daughter who are hiking the PCT and the daughter had the womans version of my shoe with the same holes. I have spare shoes since I knew they’d wear out at some point, so I had asked my sister to mail them to me. They should arrive sometime today. Hopefully. Meanwhile, I went shopping: First at Big-5 to buy stove fuel, then to Stater Bros market for food. My shoes came! Thanks, Deb! 😘 I mailed the old ones back so I can return them to REI. So I’m set to leave first thing in the morning. 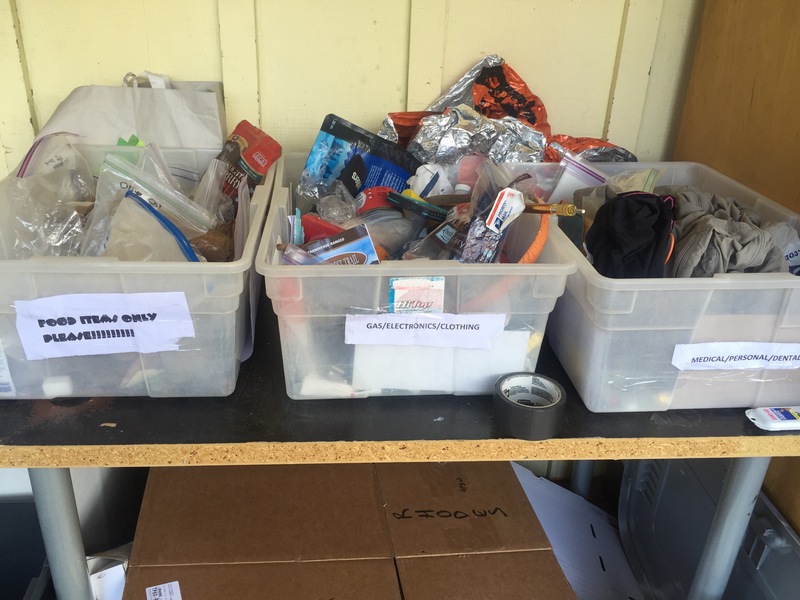 “Hiker Boxes” – Every place where lots of hikers congregate, especially where they receive Resupply boxs of food, there are Hiker Boxes. These are where hikers dump things they don’t want, and other hikers dive in grab. Kind of a Hiker Dumpster Dive. Mostly food. Some hikers realize they HATE something, like Oatmeal, M&M’s, power bars, etc. and they just dump $$$ worth of food they mailed to themselves. One couple spent hours making homemade, healthy food and found all they wanted to eat was junk. You listen to your body. Or it might be shoes, sandals, shirts, and anything cotton. Some items might be almost new. It’s a great system. Keep on keepin on, as the saying goes. Listen to your body & remember, this is not a race. I really enjoy yor blogs, especially the descriptions of your surroundings. This is where you need to be right now & I am so happy for you. Take care of yourself & enjoy the view!